I guess I have more to share about tomatoes than I realized! You heard me. There are many versions out there, but one we tried this year and love was this one from over at Simply Recipes. A few little things to mention. First off, when I read the recipe at first I was a little unsure about the mayonnaise. Mayonnaise? In a pie? Trust me. It's okay. And I even used light mayo and it was amazing. Secondly, there is no pre-sauteing or anything like that. You just chop, mix and throw it all together. Lastly, a fun little game to play at dinner is "Name the Ingredients". Jamey and I have been playing this game for years and years. Jamey tries to guess the ingredients in whatever new dish I make. I know, we are kind of like nerds. Who am I kidding? We are nerds. This dish had him stumped. It was the mayo he couldn't get. Your turn. Go stump someone. Click here for the recipe. This is a wonderful way to use up green tomatoes at the end of the season. 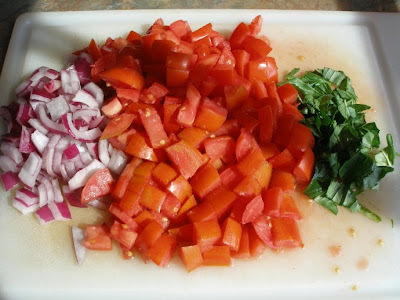 Preparing the sauce is easy since there is no need to peel the tomatoes. Just chop them up with some onions, add spices and coconut milk, let simmer a bit and can. It is wonderful served over rice or chicken. If you like curry, you should give this a try. 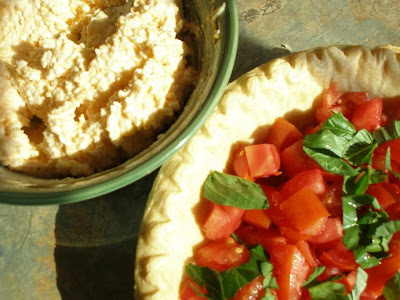 It's a really nice way to wrap-up tomato season. I usually wait to make this until the days are a bit cooler and the craze of putting up is over. It makes the house smell amazing and is so nice to have waiting on the pantry shelves for evenings when there is not a lot of time to prepare dinner- just heat it up while cooking your rice and you're done. I'm all over that pie. Coming right up. Can I freeze this pie? Do I freeze before or after baking? I wish to make several to freeze. I've never froze this pie. 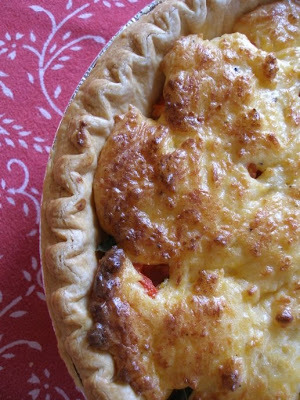 I'm afraid the tomatoes would become too watery and make for a very soggy crust/pie regardless of whether you froze it before or after baking. That's just my hunch. If you try it and it works well, please come back and tell us!